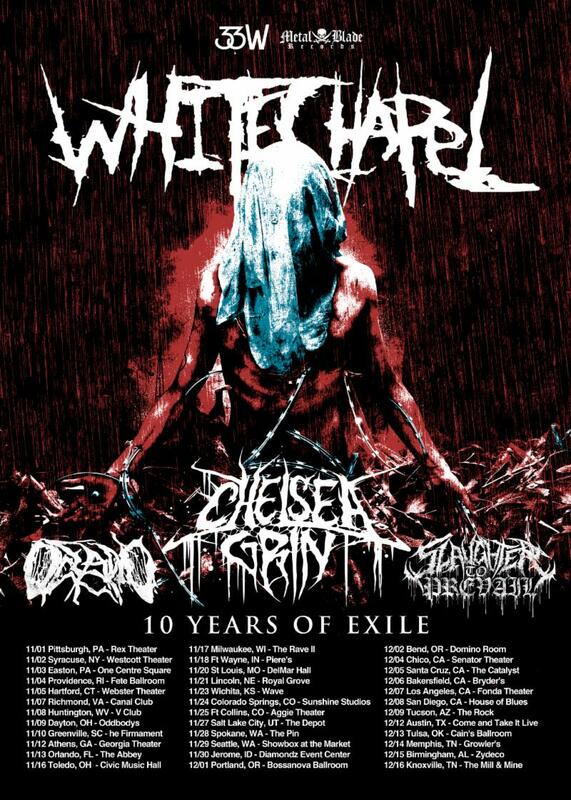 WHITECHAPEL will kick off their 10 Years Of Exile US tour next week. Commemorating the tenth anniversary of their critically-lauded This Is Exile full-length, the tour — which stretches from November 1st through December 16th — will see the bandperform the record in its entirety alongside other songs from their catalog. Support will be provided by Chelsea Grin, Oceano, and Slaughter To Prevail. WHITECHAPEL‘s 10 Years Of Exile tour serves as the final bout of shows before returning to the studio to finish recording their upcoming new full-length, due in the Spring of 2019 via Metal Blade Records. See all confirmed dates below.